Vice President Mike Pence discusses the plans for a Space Force to be created by the Trump administration. Wars have been fought on land, on the sea and in the air. But the next conflict may be a war in the immediate area above the breathable atmosphere, amid the satellites now circling Earth, Acting Defense Secretary Patrick M. Shanahan said Wednesday. Shanahan spoke during the 35th Space Symposium in Colorado Springs, Colorado, an event that brought representatives from the space community to one place to discuss and focus attention on space-related issues and promote dialogue. The secretary told attendees from both the military and the private sector that U.S. competitors already are gearing up for conflicts overhead. “Weapons are currently deployed by our competitors that can attack our assets in space,” Shanahan said. Both China and Russia have weaponized space in ways that put existing U.S. space capabilities at risk, he said. The Chinese have developed jamming capability that can affect U.S. satellite communications; intelligence, surveillance, and reconnaissance assets; and the GPS. China also is deploying directed-energy weapons and has developed advanced hypersonic weapons the United States can’t track. The Russians, he said, are doing much of the same. To protect a $19 trillion dollar U.S. economy that relies heavily on space, Shanahan said, the Defense Department must step up and protect a domain that is increasingly becoming as important as land, sea and air. The first part of that effort, the secretary said, is the development of a space force similar to the military services that fight on the land, on the sea and in the air. 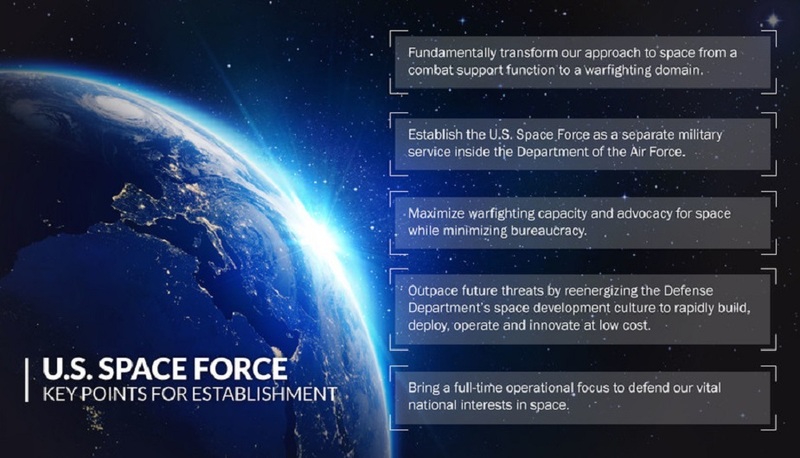 The U.S. Space Force will organize, train and equip a fighting force in the same way as the Army, Navy, Air Force and Marine Corps, he explained. The Space Force likely will start small, he said, with about 15,000 to 20,000 people drawn from existing forces. The second part of DOD’s effort is the creation of a joint combatant command, U.S. Space Command. Shanahan said this will allow for a warfighting commander that can focus exclusively on space, and he noted that President Donald J. Trump has nominated Air Force Gen. John W. “Jay” Raymond to lead the new command. Finally, Shanahan said, a Space Development Agency “will architect our future space ecosystem.” One immediate benefit there is that the SDA can look for efficiencies in existing U.S. military space systems, he said. Each military service currently runs its own unique satellite communications systems, Shanahan said, which involves more than 130 different types of wide-band terminals deployed to access these systems. The SDA can work across that system of communications capabilities and look for efficiencies and cost savings, he explained. “As we look to future architectures, we have a once-in-a-generation opportunity to consolidate and provide the department a unified, multidomain command and control system for the first time,” Shanahan said. 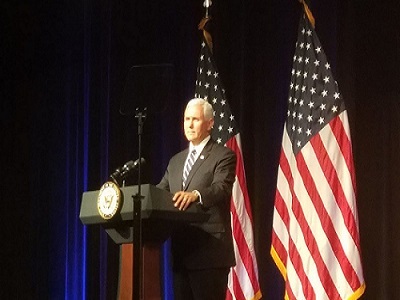 The secretary also said the SDA will work to combine the best that U.S. industry can develop for space with DOD’s unique needs to help build the capabilities needed to protect America’s future. Though DOD is moving “with purpose and speed” to get its plans in motion, Shanahan said, the department will not go it alone.